A few years ago, I wrote a bit of a rant about waiting for a parcel to be delivered without knowing when it would be coming – the middle class angst of the twenty-first century. The problem, I argued then was that the delivery companies’ information management was, perhaps not surprisingly, optimised for their needs, not mine. I have no means of giving signals to delivery companies which encourage them either to create better quality information or even to let me see or use information they might already have but either haven’t worked out that I might be interested in or haven’t bothered to make available. I am not sure what that might be – I can’t know what I don’t know – but some combination of GPS tracking of the van and position in sequence (if mine is delivery 50, then knowing whether the most recent delivery is 1 or 49 tells me quite a lot) might give me a much clearer sense of what is going on – and much greater confidence that something actually is going on. Life went on, with arrival slots for parcels (and plumbers) being as indeterminate as ever. Until today, when an email notification took me to this screen – which gives precisely the information I thought might be useful three years ago. There is the van, there is my place in the queue of deliveries, there is the ability to plan the rest of my day. Making the data you have available is a good thing. It’s also relatively easy, so there is no reason not to do it. Building services which make use of that data is also a good thing. But even those two together don’t necessarily produce the optimum result, because the data may not have been what was most wanted or needed in the first place. And even with the extraordinary creativity of the people who have been turning open data into applications, there are still not enough ways for service users to act as customers, and still not enough being done to compensate for that by involving them much more directly in the process. Interesting comparison, but not so much about the use of data, rather the relationship between the various elements of the supply chain. What motivates the third party logistics (3PL) supplier to supply improved customer service to the end customer? As you say, not you as the end customer. The motivation is the competitive advantage it provides. So it needs to be in the public sector. Seemingly missing – yes. It’s here were the real change needs to take place. And I write as a man who has spent many a frustrated year in the public sector, taking a welcome break in – you’ve guessed it – express logistics. Thanks – an interesting point. But is better information to me a random by-product of that competition, or a direct consequence of it? I can see that there could be competitive advantage in, for example, an increase in the first time delivery rate, and that better information to the end user could be a way of improving that. But even if that is right, it isn’t inherently or necessarily right – there could still be information (or other aspects of the service) which have some value to me but not to the provider. Applying that to public services which also don’t carry price/value signals, it is similarly possible that competition to provide the service does not in itself translate into better quality delivery from the point of view of the recipient. Express logistics is a very competitive market, particularly B2C. Suppliers will look to gain an edge (even if short lived) by providing a better service to their customers. Providing a better service to the end customer (the receiver of the parcel) is reflected back up the supply chain. So it’s a direct consequence. In the public sector we do not see the same focus on customer experience; and hence the same attention to the supply chain from the end customer perspective. With the competitive use of the private sector we should do, but we don’t – because the public sector is not itself in a competitive positive, which in turn is reflected down the supply chain. Also, the customer relationship can be complex. DWP is a case in point. What motivates Atos to provide a better service to those they are assessing. Who is the customer in this relationship. As I say, a welcome break from the public sector. Far more complex than the private sector. Care required with direct comparisons. 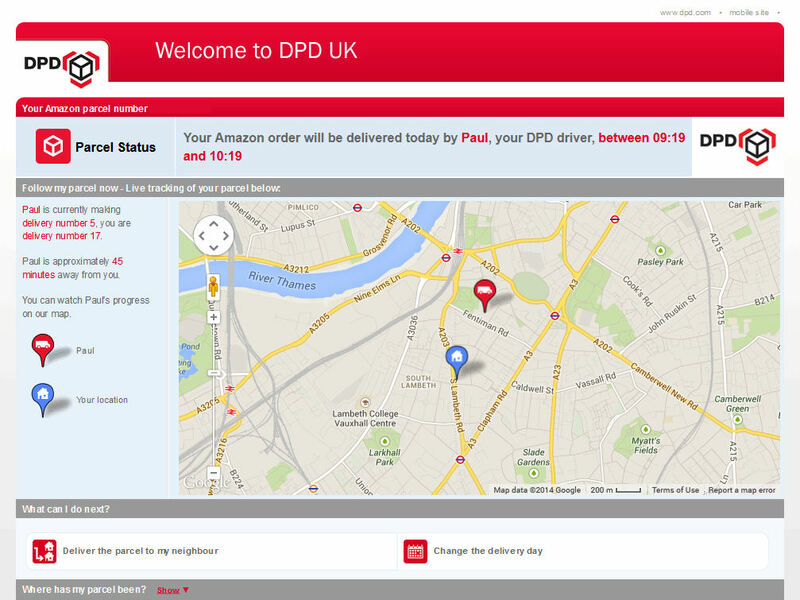 I’ve always been impressed with DPD – especially the way they send me an SMS to proactively ask whether I want to change the delivery date. By contrast, when I see that Yodel are delivering I immediately cancel my order and let the vendor know why. In this small way, I hope that my choices actively push the market in the direction I want it to go.